Code is live Unlike the Golden Globes one, very small window here : It expires on 2/22/19. Went to buy a title with the 50% off GG promo, and found that this code overrode the earlier. Doh! Put the Globes19 code back in at check out (assuming you stored it before) and it should take that one instead. 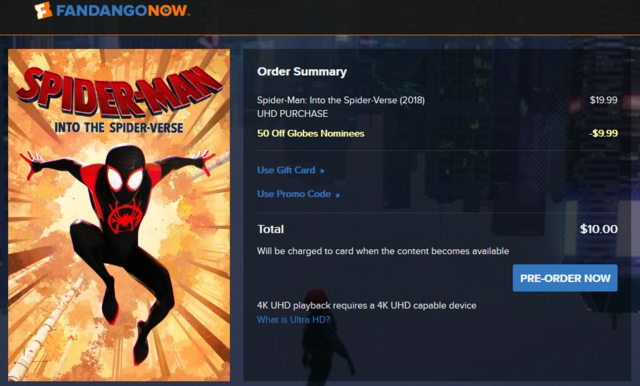 Thanks for the Globes19 tip, was able to cancel Spiderverse on Vudu and reorder on FandangoNow. When does the " Globes19 " code expire? I just brought First Man for $5, & pre-order Spiderman: Into the Spider-Verse for $10. Still thinking about buying A Star is Born & Bohemian Rhapsody. Last edited by kahuna; 02-23-19 at 01:49 PM. When does the " Globes19 " code expired. I just brought First Man for $5, & pre-order Spiderman: Into the Spider-Verse for $10. Mid April. You can see in your account that the code is still live. Thanks for all your links TheBigDave. I’ve gotten a lot of free anime to help celebrate anime month. Thanks for the info. Maybe the 2 movies I'm thinking about buying will drop further in price. I can’t get Globes19 to work. Where exactly do you put in? At checkout, where it says promo code, right? 200 plus $5 movies mostly Warner titles on ITunes and maybe Vudu. Bohemian Rhapsody in 4K UHD dropped to is $9.99 on FandanggoNow. Final price now is $5 if you have the Globes19 code in your account. I didn't see these on VUDU unless it is apparent. Time to check iTunes. Garo The Animation is free this week on the Xbox store for season 1.